" Reuben Trane, president of Island Pilot, LLC, announced today that the company will introduce the first-ever truly “green” motoryacht in America this week at the Ft. Lauderdale International Boat Show. (a) Following the much anticipated unveiling, The Island Pilot DSe Hybrid 12m is expected to be seen as the most economic as well as environmentally-friendly choice in yachting due its remarkable efficiency. This was accomplished by the creative utilization of technology that combines diesel, solar and electric power ? the components that create the DSe acronym. 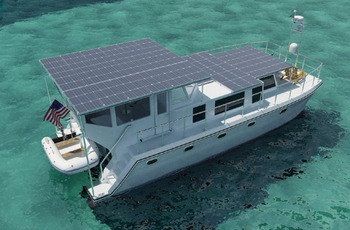 Measuring 40 ft., the DSe Hybrid can travel at 6 knots indefinitely using only solar power and 13 knots using diesel. The revolutionary combination of technology, along with a structural design resulting in the maximum amount of horizontal area on which to mount solar panels, is what enables the DSe to achieve a new standard for cruising economy.